Aah beigels, little gluten-packed balls of pleasure. What distinguishes the London beigel, apart from the spelling (the rest of the world spells it ‘bagel’) is its harder surface (achieved by boiling the dough before baking) and the coarser texture of its interior. Originally Jewish, they are ideal for breaking fast after the Sabbath because they can be prepared beforehand and left to prove on the day of rest. Two shops have been fixtures on Brick Lane for donkeys years Beigel Shop (to the left as you’re facing the shops) claims to be Britain’s first ever beigel shop, opening in 1855, and the Beigel Bake (aka Brick Lane Bakery, to the right) which opened in 1974. Along with the local synagogue, they are last historical vestiges of the local Jewish community, many of whom settled here after escaping persecution in Eastern Europe during the 30s. Legend has it that the Beigel Shop at #155 was owned by two brothers who fell out and one went off to open the Beigel Bake a couple of doors up at #159. Still others say they are the same business. I’ve never had the courage to ask the stroppy staff which story is true but I suspect both are just urban myths! Here’s a video about the Beigel Shop. Both shops are open for 24 hours and sell bread and cakes as well with most of the baking being done in the small hours. This was how I first discovered them, at 4am in the morning after a hard night on the town, as part of a long queue of hungry clubbers, policemen, refuse collectors and other assorted nighthawks. There’s something very warming about coming into a bakery while it’s still dark outside. What blows me away are the huge tidal waves of beigels pouring out of the ovens and moving glacially down the production lines (the Bakery alone produces 7000 a night). I try to drop in whenever I’m in nearby, eat two on the spot and take at least a dozen plain home for breakfast and the freezer. So which one is the best? I decided to have something from each to decide. First I had the classic Hot Salt Beef beigel from the Brick Lane Bakery; thick slabs of hot salted meat, topped with fiery mustard and a cooling slice of pickled gherkin on request, although they forgot the gherkin (A-). The beigel itself was perfectly baked with a nice shiny firm surface all over, uniform colouring both top and bottom and a softer yet firm interior that was a joy to bite into. I bought half a dozen plain beigels here as well. At the Beigel Shop I had the Chopped Mackerel option, the pickled vinegary taste of which appeals to my Nordic taste buds (A). Sadly however, the bun was disappointing, nicely firm and browned on the base but overly soft, pale and squashed on top, as were the half dozen plain ones I bought on the side. It seemed I’d been unlucky and hit a bad batch. At 25p a throw you can’t complain too much though. Not that you’d want to, as service can be brusque (but generally friendly) in both places. As you can see, quickly filled beigels aren’t particularly photogenic but I can assure you they are much tastier than they look. Equally classic would have been the Salmon and Cream Cheese version but you can make those at home. I also had a huge apple turnover from here too which was hearty and tasty if lacking in finesse (B). The next step was to cross reference my findings with a couple of local friends who I had blind taste the two plain versions as well as tell me their usual preference. The results were split, with current tastes conflicting with historical experience. 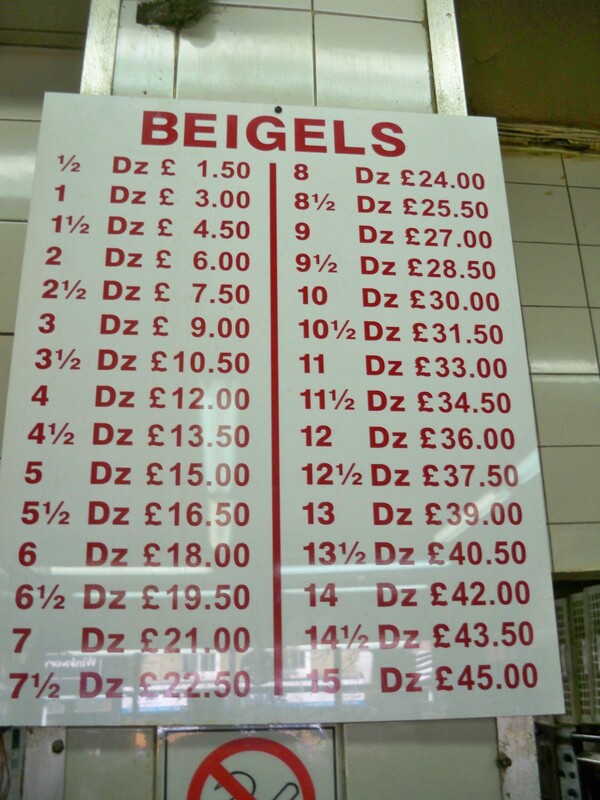 It seems the Brick Lane Bakery at #159 had the best tasting beigels on the day, but usually the Beigel Shop is better. However, it was pointed out that my testing was fundamentally flawed due to not having the same fillings from both shops. Seems that I’ll have to rerun the tests a few times to be completely sure. Bear with me.